Home Tags Articles tagged with "Rotary"
The Maricopa Rotary Club recognized a theatrical high school senior, as well as an eighth-grade “model student” Wednesday night as November Students of the Month. College and Career Counselor Bernadette Russionello nominated Maricopa High School student Ivie Keene for the accolade. The senior is involved in a school mentorship group, National Honor Society and DECA. Keene also holds leadership positions in school theatre as a student director and actor and is president of the Arizona Thespian Society. “Rotary is told that she is a phenomenal student since her freshman year, with a positive attitude, unstoppable work ethic and commitment to school and your community,” said Alma Farrell, Rotary youth coordinator. Keene aspires to be involved in Broadway one day, “but is also willing to return to MHS to be an English and theatre teacher,” Farrell added. Farrell reported Torres as being described by school officials as a “quiet leader,” model student and hard worker. Torres is involved in athletics and various after school activities and was praised for being a positive role model for other students. “(He) work(s) extremely hard on each and every assignment, going above and beyond teacher expectations and he is a great leader across all grade levels and gets along with everyone,” Farrell reported. 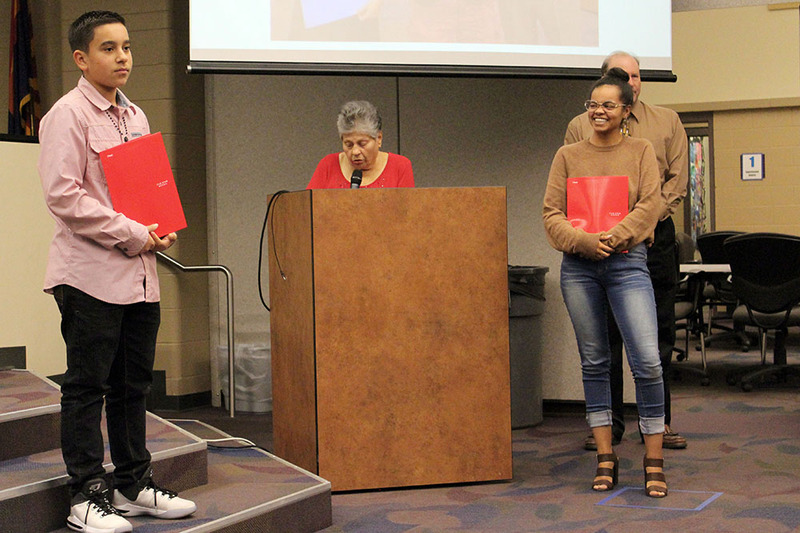 Torres and Keene were accompanied by their parents and siblings during the ceremony which Rotary holds monthly inside the Maricopa Unified School District Administration Office during governing board meetings. The Maricopa Rotary Club was founded in 1954 and is part of an international, service-oriented, non-profit organization. “We hope they will be our future leaders of our community and it’s very good for them to start at this early age to learn how to be leaders,” Farrell said. 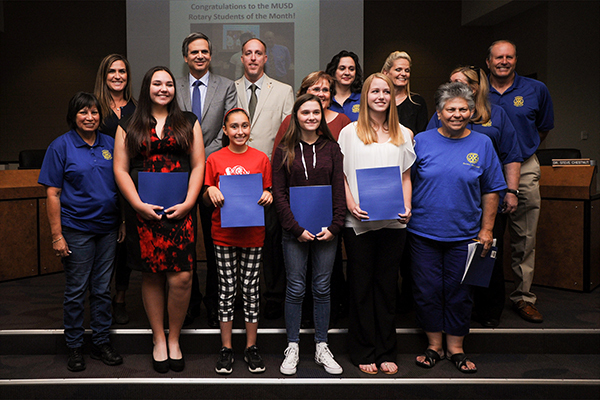 The Maricopa Rotary Club presented their monthly selection of outstanding students for September and October at the MUSD Board meeting Nov. 17. The three middle school and three high school students were honored and chosen by leaders at their schools based on achievements both in the classroom and out. According to the Rotary Club, recipients of the awards, hailing from Desert Winds and Maricopa Wells middle schools and Maricopa High School, have all achieved stellar grade reports and have exhibited admirable character traits. As such, their teachers and activity leaders have deemed their actions exemplary and worthy of recognition. Also for the month of September, Desert Winds Middle School student Zeya Suchite was recognized for being an “excellent student and awesome athlete,” and for her participation in numerous clubs and city activities. Maricopa High School Student Lauren Davis was also chosen as the club’s October student of the month. According to her teacher, Katherine Persitz, Lauren “is a dedicated and faithful student who goes above and beyond to take care of herself and the people around her.” She is a member of the National Honor Society and MHS Soccer player. From Maricopa Wells Middle School Zeah Zimpleman was chosen as the October student of the month. Carrying a 4.0 GPA Zeah is a member of National Junior Honor Society, orchestra and the MWMS Volleyball team. She is also known to participate in community service projects through her church. Madison Russo was chosen from Desert Winds Middle School also for the month of October. Madison is the DWMS Student Council secretary, she sings in the choir and is a member of the soccer and volleyball teams. According to Roger Wagner “she exhibits a great work ethic” and has an “approachable fun-loving personality.” Madison is also well known to go out of her way to help others. For more information on the Maricopa Rotary Club please visit their website.